Back when I was in college, I took a Children’s Literature class as an elective. 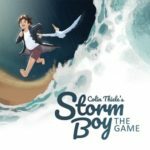 I had to read and learn about a lot of children’s books, and yet I’ve still never heard of Storm Boy. But after doing some research, apparently they even made a movie about it so I guess it just passed by me. And now there’s a game about it, too. Actually it’s more of an interactive story book, and it’s available to download on most current consoles, PCs, and mobile devices, but reviewed on PS4 here. 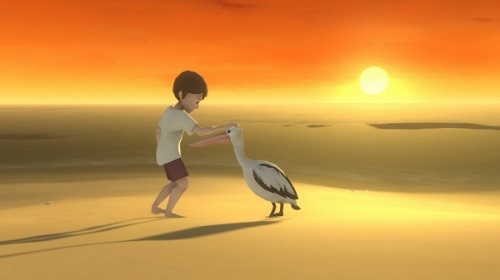 Join Storm Boy as he takes care of and has adventures with a pelican named Mr. Percival on their seaside home. When you start the game, you control the boy by moving him right and left along a beach. As you walk by, words from the story will appear for you to read. At certain spots, a little balloon with a picture will appear. When you press a button near these balloons, a mini-game will start. Actually most of these are just activities, as there’s not much game there. You can draw pictures in the sand, find shells, play fetch with the pelican, and more. When you finish the story you can play the mini-games and view scenes whenever you want. It would’ve been nice if the game featured narration for younger players who may not know how to read yet. Also the game is very short. I was able to do everything in about an hour AND get all the PS4 trophies for it! Yes, Storm Boy is the first PS4 game I got a platinum trophy for! Also it would’ve been nice to have some better instructions, as I skipped by the first couple of mini-games without realizing what they were. Even so, the game is still somewhat charming and it’s nice to see titles like this make it to consoles and not just stick to mobile devices. If you are a fan of the book, you may enjoy this, too. Storm Boy: The Game is rated E-10 with an ESRB descriptor of Mild Violence. SPOILER ALERT! The pelican gets shot. You see a duck hunter and his gun, and you hear it go off, but that’s it. So no grisly death scenes or anything, but it is a little sad. Reading skill is needed for the text, but most anyone can play without help as even the mini-games that provide a smidgen of challenge can be skipped.